EDIT: We’re back online. FIREBALL!! Fireballs aren’t the only trick the Wizard has up his sleeve… Stay tuned for Wizard event Maintenance break coming soon! 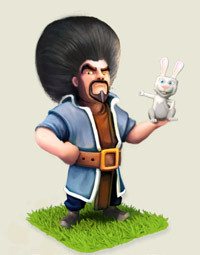 The new wizard looks groovy, his hair is huge! He also holds a rabbit in it’s hands. The video’s suggest a preparation phase and a new magic phase. You can’t throw a bunny with the new wizard as the video suggest. The building time and costs are cut in half for a limited time. The training time and building costs are cut in half.